god of chaos and parties. nuf said. Firestorm was a gentlecolt of many tastes. One of those tastes was collecting and studying magical artifacts. Not for the purpose of preservation or understanding, though he did turn over his notes to the local magical schools when he made significant finds. No, his interests were more for the expense of a prank at one of his many parties. Firestorm loved hosting parties and gatherings. He loved social gatherings of any kind. He hand a hoof in many things as it were, and loved to bring the nobility and social elite back into touch with the common ponies. He oft hosted parties for any pony he felt deserved them. And the purpose of his studies was to use the magical items as a sort of party joke or game. To which end, his parties were often riots. It was today that he was once more working his personal lab, though the door to the balcony was always left open. He was a lively old stallion. He loved visitors. And always made certain that any pony or other being that thought to stop by was more than welcome. His minimal staff were more like friends to him. His lush garden full of vibrant colors and signs telling ponies to help themselves to any flowers they wanted. He oft cast a look outside to see if somepony was coming. He was tinkering with an amulet today. He did not know what magical properties it had. Aside from the fact it practically radiated magic. His first bit of research was being conducted to determine exactly where and when it came from. When was it created, where was it created, and most importantly, why was it created? Those first three questions were always answered before he began other research. So far he had the when, and where. Though it was vague at best. The amulet was roughly 300 years old, and had come from a ruin located in the mountains outside Canterlot. He had bought it from a traveler, when he detected its magical properties. The traveler was an Earth Pony, and had no sense to tell what it was. Determining that the traveler was a ruin diver, he got him to tell where it came from and mark it on a map. Though at best guess Firestorm figured the pony had been a little less than completely truthful. After all, no pony wanted to give up their treasures that easily. Firestorm took a moment to sit back in his desk chair, spinning idly as he chuckled to himself, thinking up what possibilities it could be. The amulet was a mystery he wanted to solve, but in time. His research so far determined that it was for a noted pony that once lived in that area. But he could not find something as to why. It was strange, really, how a crowd could make it both harder and easier to have a private conversation. One could hardly help being overheard, but the general surssurations of outside talking would blend the words together into something unintelligible to the casual listener. Not to mention the fact that most ponies, kirin, and ryushima were too absorbed in their own chats, or contemplations of the Cherry Blossoms, to pay much attention to the words of others. Even if one was dressed like a punk, and the other was an ancient spirit of chaos. 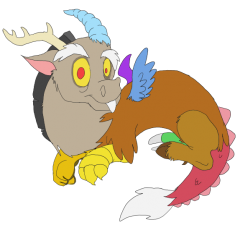 They made an odd pair, Akairo and Discord. The first being a kirin dressed all in black, as if she was still the high-school yanki, with a baseball bat that was usually used for sporting activities. 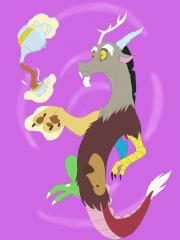 And the second being... well, Discord. He hadn't exactly been discreet when he first arrived; it was probably not in his nature. That said, the pair were one a grassy knoll far from the crowd of initial impressions, looking over the whole Sakura Spring festival from a distance. "I'm glad I met up with you, before I left." Akairo began. "I was about to leave the country, on a search for... sympathizers, with my cause. There are few on these islands that would agree with my views, but I think you might be one of them." It was perhaps a presumptive assumption, but it stood to reason that the very incarnation of chaos would dislike on principle an extended, homogeneous, exploitative order, right? It was early morning, about Four Am when a heavy wagon rolled into the Everfree Forest. Choosing a clearing that was apparently safe, Rune Writer stepped out of the wagon and put a crystal down. A bolt of magic to the crystal, and the crystal had grown to a fully sized tent for him to stay in for tonight. While he did have more amenities in the wagon, he didn't want to waste the magical power if he didn't need to. This was why he often saved the enchantments of the wagon, leaving them off unless he needed them. Sighing as he looked around the Everfree he remembered stories he had been told when he was younger, of how dangerous the Everfree was. Well he'd find out for himself if the place was so dangerous and if so deal with it. After all he had an assortment of magical weapons, his wagon and an arsenal of spells of Harmonic, Dark and Chaos Magic at his disposal. Surviving a few hours before he went into Ponyville shouldn't be that hard, right? In all honesty, it had been a rough trip from the Frozen North here, and Rune was looking forward to meeting the Princess whom Shadow had given the Red Sun Sword to and taking it back from her. It was a family heirloom, and was supposed to stay in the family. Noircord! I love Noir a bit too much, love rolepalying it. Still practicing that coloring style. It's weird. 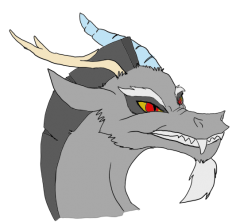 A doodle of a chibi Discord! That is all. 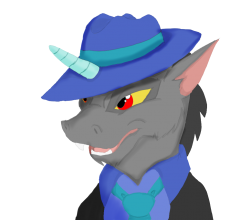 A doodle of Discord drawn on smartphone at midnight.